A capital gain is a profit made from the sale of any capital asset where the sales price exceeds the cost of the investment, referred to as the cost basis. If you lost money on an investment, you've incurred a deductible capital loss. You'd have a capital gain of $3,000 if you sold an asset for $6,000 and your cost basis was $3,000. You'd have a $3,000 capital loss if you sold the asset for $3,000 but your cost basis was $6,000. The equation is basically sales price less basis. Capital assets are investments such as stocks, mutual funds, bonds, real estate, precious metals, coins, fine art, and other collectibles. If your investment has an increase or decrease in value when a capital asset is sold, you're taxed on the change of value. Investments can also produce income in the form of interest, dividends, rents, and royalties. Income produced by investments is taxed as income as it's generated. Cost basis is the original price you pay for a capital asset plus any associated costs, such as commissions paid to brokers. In some cases, an asset's cost basis must be adjusted up or down to reflect its true cost for tax purposes. This is referred to as an "adjusted basis," and it's calculated by beginning with the original cost basis, then making adjustments that either increase or decrease that basis. Losses realized on the purchase and sale of personal property are not deductible. You can, however, claim up to $3,000 in capital losses as a tax deduction as of 2019, subject to a host of rules. You can carry any unused balance over to subsequent tax years if your losses exceed this amount. For example, if you have a $9,000 loss overall, you can claim $3,000 a year for three years in many cases. How capital gains are taxed depends on what kind of capital asset you invested in and how long you held that asset. Gains are grouped into short-term and long-term holding periods for tax purposes. The short-term holding period is one year or less. The long-term holding period is more than one year. Short-term gains are taxed at ordinary income tax rates according to your tax bracket. Long-term capital gains are taxed at long-term capital gains rates, which are less than ordinary tax rates. The long-term capital gains tax rate is either zero percent, 15 percent, or 20 percent as of 2019, depending on your income. It can be worth it to consider waiting until you've owned an asset for one year and one day if you're on the cusp of selling an asset that will likely result in a profit before that time. Tax planning for investors focuses on deferring the sale of profitable investments until you qualify for the discounted long-term capital gains tax rate. Long-term capital gains tax rates are somewhat different from what they were in 2017 due to provisions of the Tax Cuts and Jobs Act (TCJA). They were once tied to ordinary income tax brackets, but capital gains now have tax brackets all their own. Short-term gains tax rates have changed as well under the TCJA because the new law alters ordinary income tax brackets. Talk to a tax professional if you realize a capital gain during the tax year. You might be required to make estimated tax payments on that amount to avoid a tax penalty. Some precious metal coins and bullion are considered regular investment assets, however. They're not collectibles for tax purposes under Internal Revenue Code Section 408(m)(3). Real property that has been depreciated is subject to a special depreciation recapture tax. A 25 percent tax rate applies to the amount of gain that is related to depreciation deductions that were claimed or could have been claimed on a property. The remainder of the gain is taxed at ordinary tax rates or at long-term capital gain tax rates, depending on how long the property was held. You can refer to IRS Publication 544 for more details on depreciation recapture. Capital gains and losses on small business stock may qualify for preferential tax treatment. This tax break applies to small businesses organized as C-corporations. Gains can be partially or fully excluded from tax under Internal Revenue Code section 1202 if the company had total assets of $50 million or less when the stock was issued. Losses on small C-corporation stock can be treated as ordinary losses up to $50,000 per year under Section 1244 if the company had total paid-in capital of $1 million or less. Small business investors can request that companies certify their stock as qualifying under Section 1202, Section 1244, or both at the time they make an investment in the company. For more details on these two provisions for small business stock, you can refer to IRS Publication 550. Fixed assets used in your business are taxed as ordinary gains. Business assets include all furniture, equipment, and machinery used in a business venture. Examples include computers, desks, chairs, and photocopiers. Ordinary gains are reported on IRS Form 4797. Refer to IRS Publication 544 for further details about selling business assets. An important distinction exists between real estate that's held as an investment and real estate that serves as a taxpayer's primary home. In the latter case, $250,000 in profit is excluded from capital gains tax for individual taxpayers, and this increases to $500,000 for taxpayers who are married and file joint returns. The taxpayer must have lived in the home for at least two of the last five years preceding the sale. Other rules apply as well. High-income taxpayers might also have a 3.8 percent unearned income Medicare contribution tax applied to their capital gains and other net investment income, thanks to the Health Care Act of 2010. The highest tax rate that could apply to capital gains income is 37 percent + 3.8 percent = 43.4 percent on short-term gains taxed at ordinary income rates for these individuals, or 23.8 percent on long-term gains: 20 percent + 3.8 percent. Capital gains are reported using Schedule D and Form 8949. 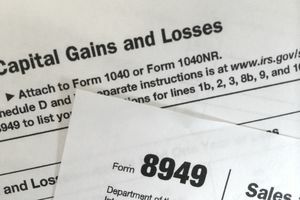 Taxpayers might have to use the Qualified Dividends and Capital Gain Tax Worksheet found in the Instructions for Form 1040 when calculating the proper amount of federal income tax. All the details regarding individual trades are reported on Form 8949, and totals from Form 8949 are then summarized on Schedule D, then transferred to line 13 of Schedule 1 of the new 2018 Form 1040. Form 8949 is organized much like a spreadsheet, with all the essential information about each investment you sold during the year. Capital gain or loss is reported for each transaction, then your total gains or losses are figured. You will have either a net profit or a net loss from all your trades. There are special rules for capital losses, such as annual limitations on capital losses and wash sale rules. Investors should keep track of all their investments. This information is essential for calculating the amount of capital gain you have. You must know what you bought, how much you invested, your brokerage fees and commissions, and when you bought the investment. You must also know the date of sale for your investment, the gross proceeds from the sale, and any fees or commissions you paid to sell. You might want to use a spreadsheet or personal finance software to keep track of this information. Personal finance programs can provide more robust investment tracking features than spreadsheets. Your broker might also have tools for tracking cost basis, gains, and losses. There are also specialized investment recordkeeping software programs available, such as GainsKeeper. Retain any reports and trade confirmations as backup documentation. Annual reports from your broker are especially helpful, and these should be kept along with your other tax-related documents. Trade confirmations and gain/loss reports will come in handy when you're preparing your tax return.